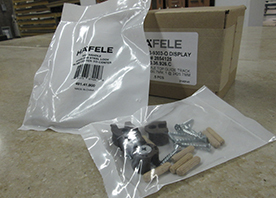 At Häfele America we offer the ability to provide customized packaging solutions that can help you operate more efficiently. We offer digital weighing, identification services, custom sorting and packaging - as well as automated dispensing solutions. Contact us at 800.423.3531 for more information. Advanced packaging machinery make it possible for Häfele to break up your order in any combination of quantities. And with our custom labeling system, we can mark your packages with appropriate barcodes and Item numbers as well as your company name and logo. 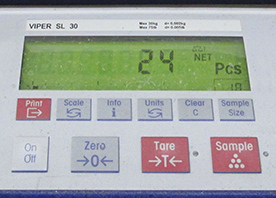 Calibrated before each packing process, our ultra-sensitive scales ensure that every bag in your shipment contains the proper quantity of hardware. 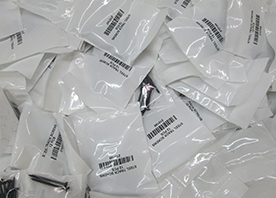 We'll seal off every one of your custom-sorted polybags. The hardware will arrive to your customer in a clean, professional looking package. 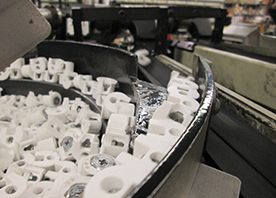 Under the supervision of a Häfele packaging specialist, our dispensing bowls allow us to accurately gather specific quantities of many different types of hardware. 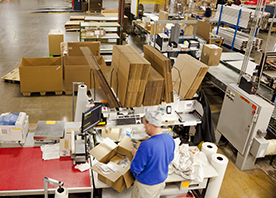 We can accomodate your custom sorting needs by placing the correct number of items in each bag. We can also place different items in a bag as well. Before we ship your order one of our trained packaging specialists inspects the contents to ensure accuracy. 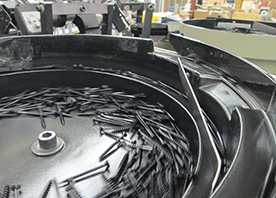 For more information around our Packaging programs, please contact us at 800.423.3531. We would be happy to review your needs and look for solutions.